Home » Specialty Appliances » Bread Machines » Which is the Best Rated Bread Machine of 2018? Which is the Best Rated Bread Machine of 2018? Bread machines are sensitive kitchen units. Most chefs believe that in spite of all the settings and fine tunings, the breads produced have nothing on self-kneaded loaves. However, these machines do save a lot of time and effort needed to make bread on a regular basis and the loaves made from the home machines are generally inexpensive and healthier compared to the ones you buy from the supermarkets. We’ll tell you what the best rated bread machine picks are this year and why they are good. But if you just want to see more options, Amazon is the place to go! There are many factors to consider when purchasing a bread machine. These include the type of operation the machine is best at and how many programs are available, speed of kneading, rising and baking, versatility in being able to make different kinds of bread, ease of cleaning, loaf sizes created, machine size, and price. But what is the best bread maker for your needs? Do you prefer full a range bread making machine that makes breads and pizza dough as well as cakes, or a smaller model that only makes small loaves? Many experienced bakers prefer to let a machine do the kneading and the first rise, after which they finish off the subsequent stages manually with baking done in an oven. You may find that a stand mixer with a dough attachment better suits your needs in this case. The following is a review of some of the top rated bread machines of 2018. We also do a head to head comparison of 4 top of the line bread machines from Zojirushi, Breville, Cuisinart and T-Fal. If you like a big, rectangular-size bread loaf and a machine that can make gluten-free bread or sour dough just as easily as any other, pick this one as the motor power allows for this. The Zojirushi BB-PAC20 control panel is reasonably simple and the LCD display is easy to read. The Zojirushi BB-PAC20’s lid has an additional heating element which effectively resolves the past problem this model had with crust color and you can control the amount of browning you want from 3 settings. With 2 kneading blades, this machine ensures proper mixing of your dough and can give you a higher rise. You can have your bread in less than 2 hours thanks to a quick baking cycle. A 13-hour delay timer ensures that you can wake up to a sweet aroma of baking bread. The Home Bakery Virtuoso Breadmaker has 10 pre-programmed baking options, including gluten free, whole wheat, cake, jam and sourdough starter, and you can also set up to 3 of your own baking cycles. All you have to do is measure and add your ingredients in the right order according to the recipes, make your selection, and start the machine. The LCD clock will let you know how much time is left. The Zojirushi’s non-stick baking pan has 2 handles for easy and safe removal. The viewing window is large and there’s an indicator light too. The bread-maker also includes a user manual and DVD with different recipes as well as a measuring cup and a two-ended measuring spoon. Users love how durable the pan is and how consistent the machine is with the results. They say that this is the best bread making machine on the market. The only downside is that this unit is big and heavy compared to most bread makers. It is also not a cheap option, so it may only be worthwhile if you’re a frequent bread baker. Read our reviews for more choices for breadmakers that make good glutenfree bread. Is this the best bread maker on the market? Could be. The Breville Custom Loaf Bread Maker’s 13-hour timer ensures that you can have a warm baked loaf when you’re back from work or on a lazy Sunday morning. Also, with over sixty recipes included for whole wheat, basic, gluten free, sweet, crusty, yeast free, jam and custom breads, you’re always spoilt for choice every time you get to this machine. This is also the best machine to have if you primarily like healthy whole wheat and whole grain breads, as there is a pre-warm option that is essential for making them. The others don’t have this option. The unit’s interface computes baking time and temperature the moment you make a selection using the dial and even lets you choose the time you would want your loaf to be ready. The automated dispenser adds nuts and fruits at the right time during the kneading cycle. The Breville Custom Loaf Bread Maker has a collapsible kneading paddle that thoroughly mixes ingredients after which it collapses during baking phase to minimize baked loaf’s bottom hole. The excellent LCD display helps when you’re choosing from the 3 crust colors and the 4 loaf sizes – 1½, 1, 2½ and 2 pounds. One thing you have to watch out for is how you attach the collapsible paddle. If done in reverse, the mechanism will scrape the Teflon coating of the baking pan. Many users do not realize that this happens only because the paddle was not inserted the right way when assembling the parts. With heavy use, you might have to replace the paddle after a while. 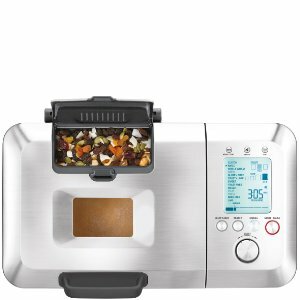 The Hamilton Beach HomeBaker is very inexpensive and prepares up to 2 lbs of bread, jams and cake automatically; no interference is required except when adding ingredients at any stage, selecting a cycle and starting the machine. It operates with any of 12 cycles and has several recipes for preparing whole wheat, white, sourdough, French, and country breads. However, this is the best French bread machine, as it does its best job when you want a soft and fluffy center with a hard crust. This bread maker comes with 12 settings, including sweet, quick, whole grain and gluten-free, which allow you to bake wholesome breads using different flours. Furthermore, you can easily make cakes, croissants, flat breads, jams, and pizza dough. You can also select from light, medium or dark crust options. The delay timer allows you to add the ingredients and bake later. There’s even an audible beep to let you know when it’s time to add fruits and nuts and remove the paddle before baking starts. The auto-warm feature keeps baked bread warm for up to an hour after complete baking. The Hamilton Beach Homebaker employs a kneading paddle with an extra one included, so there’s always one free if the other’s in the dishwasher. A nonstick baking pan is also included and all these are easy to clean by hand or using a dishwasher. The bread maker is easy to use, affordable and versatile, and does its best baking for French-style bread. Even though it is quite big, it is worth making space for it on your kitchen counter. Another machine that is very cost effective is this one. If you want a bread machine for quick bread, the Oster Expressbake Breadmaker can give you a loaf in just 1 hour if you select that option! You can select loaf size of up to 2 lbs and one of 3 crust color settings. From the Menu options, select one of 9 bread options, including the Expressbake. The bread types are also included here – Basic, Quick, Whole Wheat, Dough and Sweet. The Quick option is for yeast-free doughs, like cake and banana bread. You can also set a 13 hr timer for delayed baking. An audible alert will tell you when it’s time to add fruits and nuts if you want to, and the LCD display shows you at what stage in the process the machine is in. Many users like to use this unit only for the kneading and first rise, but those that use it for all the cycles say they love the bread that is produced. They also say to use your own recipes instead of the ones given in the included manual. With the Cuisant CBK-100, all you need is to use the easy-to-read display in deciding the loaf sizes (2, 1½ and 1 pound) and select from the 12 preprogrammed options. Adding ingredients in correct proportions is all that is required from you; the Cuisinart CBK-100 will take care of the rest. With this bread maker, you bake as you wish. It has a timer setting that can delay baking for 13 hours. It also has power failure backup, a removable kneading paddle, and a viewing window complete with a removable lid. This makes it easy for you to remove the dough after jus the kneading and rising cycles if you want to bake it separately in an oven. The Dough option is ideal for kneading any type of dough, including for pizza. The Pasta option gives you perfectly kneaded pasta dough! In addition to rapid baking and pre-packaged yeast dough mix settings, the bread maker lets you make chutneys or jams. It can keep your loaf warm for up to an hour following baking. This bread making machine is inexpensive and easy to use making it a favorite for most bakers. It weighs 9 pounds so you can place it at your preferred position in the kitchen but also use the cool touch handles to move it elsewhere. It is very simple to clean and most of its parts can be safely cleaned in the dishwasher. It comes with a measuring cup, measuring spoon, and recipes. ← Which is the Best Juicer Under $100?